Much like the rest of my life’s activities, I am engaged in industrial scale wargaming. My DIY involves builders, personally knocking down walls and generally gutting rooms of everything. 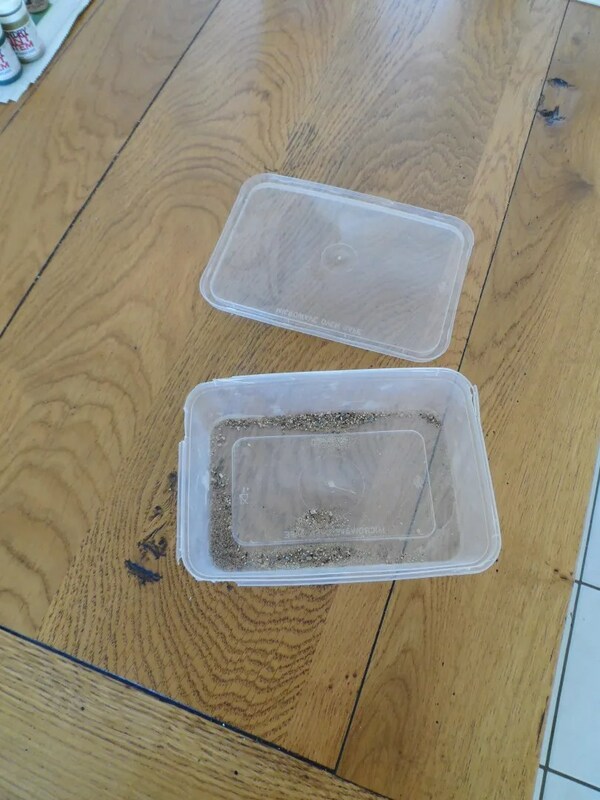 The plastic box is a six by four inch tray about an inch deep that was full of my mix of sand, ballast and gravel about two months ago. At the w/e I ran out of black undercoat and nearly ran out of varnish spray – in both cases I keep a ‘buffer’ can of spray…so I must have been getting through it at a great rate of knots. Similarly my brushes wore out. I’ll be posting some more suggestions to reduce costs for all these basics – it has been suggested that 10-20% of our gaming budget is spent on the basics so anything to reduce that is beneficial. Good job I have some Evidence(TM) for all this activity to come shortly….